PitPass has an article today that explains why Ferrari are the only team not to welcome the FIA's suggestion of budget capping, rather than restriction on wind tunnels and other forms of testing. Apparently, Ferrari's earnings from F1 amounted to $100 million last year. That is before things like sponsorship and advertising revenues are taken into account; the figure includes just the prize money for winning the Constructors' Championship and a payment agreed by FOA as a reward for committing to stay in the formula until 2012. It is no wonder that the Italian team do not like the idea of budget caps when they are raking in money at this rate. Contrast this with the present financial struggles of Super Aguri, a team that has demonstrated its ability to compete in F1 and gained a large fan following as a result, and one has to wonder at the huge disparities of earning power in the sport. It is necessary that there should be a sliding scale of prize money from winning down to merely taking part but should the differences be so great? As for paying to extract a promise from a team to remain in the game, that seems far too close to bribery for comfort. We tend to accept that these huge sums of money are inevitable in F1 today, excusing it with the thought that the sport has become a business and there is no turning back. Without money, the sport would soon lose its claim to be the cutting edge of technology. But it should be remembered that money is also the cause of many of the things that we dislike most in modern F1: the substitution of time-honored circuits with featureless tracks in countries that have no history of motor sport, the constant changes to the regulations in a doomed quest to bring down costs, the dominance of manufacturer teams that could leave the sport tomorrow without a backward glance, the impossibility of new teams entering and surviving in so costly a competition. It is perhaps the most serious threat to the survival of F1 as a sport at all. Money built F1 to the high point of popularity it enjoys now and money threatens to be the reason for its changing into something no longer recognizable as motor sport. The FIA are to be commended in that they seek to find a way to preserve the sport without warping it beyond reason; it is only their suggested solutions that I take issue with, believing that there are better ways to achieve the goal. I do not think that the budget cap idea is workable - there seems to be so many ways in which teams could cheat and fiddle the returns. But it is preferable to the suggested alternative of limiting wind tunnel and other testing. Let them try it and we shall see how effective it is, say I. Beyond that, however, it may be time for the FIA to consider its prize-giving structure. It seems senseless to be paying the richest teams large sums of money while the little guys receive no more than token payments. All are necessary for there to be meaningful competition and the sport is the poorer for every Minardi that falls by the wayside. If the FIA were to find a way to make things just a little easier for the small teams, I would feel more convinced of their genuine care for the sport. I agree, there needs to be more equity about how the funds are distributed. I'm not saying that it should be equal, but it does seem ludicrous that the team that needs money the least is awarded with the most. I posted this earlier but it has disappeared. I think other teams will be against budget caps. I cannot see McLaren, Toyota or Honda being in favour. The FIA have asked them to consider the idea and regularly when this happens it is assumed teams are entirely in favour. Eventually when reality hits some of the teams will object. Prize money has to reward achievement. There is no value in a competition where the winner is not rewarded. The Ferrari bung however is outrageous. It should never have been allowed. How can the FIA claim no bias when one team is being rewarded simply because it is famous. Ferrari have been receiving payments like this for decades. For the 20 years when the team won nothing they were receiving payments for effectively being well known. For me the fundamental problem is the technical regulations. The regs could be written in a manner that renders multiple wind tunnels unnecessary. It is perfectly possible to write technical regulations that limit aerodynamic efficiency. For example you could have single element front and rear wings with spoons and curves banned. All the small areo device could be banned with no difficulty. The example I always use is Formula Ford which is now entering its 42nd season and no-one has yet found a way to put aero devices on the car so it is possible to legislate in a way that would make excessive wind tunnel or CFD testing totally non-viable. It doesn't matter how the sport is structured certain teams will always win and make profits and others will always lose on and off the track. Sorry about the disappearing comment, Steven - it happens when the program reckons you got the CAPTCHA code wrong. If you scroll down after sending the comment, it tells you this in red letters but it's easy just to move on, thinking that your comment went up. I always check these days and it's surprising how often I get the numbers wrong (if I believe the program - sometimes I think it's just messing with me). I agree that prize money has to reward achievement - my quibble is that it seems to be a little too heavily weighted in favor of those who win and gives almost no recognition to the efforts of the also-rans. In an expensive sport like F1, I think participation needs to be rewarded too. A couple of team managers have expressed support for budget capping and this gives the impression that they are all in agreement with the lone exception of Ferrari (who have made their dislike of the idea clear). When it comes to the nitty gritty, they may not be so keen, it's true. And I agree totally with your thoughts on the regulations - all the fiddling about with details that the FIA does will achieve nothing. I must be dumb, so please explain this to me again. 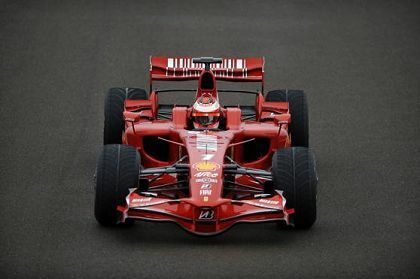 Why should Ferrari be against a budget cap BECAUSE THEY ARE MAKING MONEY FROM F1. It would mean that they would make MORE money if they were limited to how much they could spend. As far as controlling costs in F1. there have been countless rules to do that in the last decade. Single tire supplier, no qualifying tires, engines to last a whole race weekend, then 2 races, etc. etc. None of has lowered costs. Not that I mind about that, but it hasn't tightened the competition. In fact the last few years have seen LESS teams in front than in the past. The reasoning behind the budget cap is that the mechanism for checking this already exists. It's call "accountancy". It's been used for years by the tax people. Of course it also means that there are years of experience on how to work around it. But it has it's advantages to posting a FIA guard with a stop watch at each team's wind tunnel. On the face of it, you're quite right, Gary. But one of the reasons behind Ferrari's success over the last decade has been the amount of money they have been able to spend, greatly aided by the FIA. The budget cap would mean that their massive earnings are suddenly irrelevant and they have to compete from the same financial base as the other teams. In the context of making money, yes, they might be more successful - but when it comes to the championships, they would be giving up a tremendous advantage. You're right about the FIA having failed to control costs over the years - even they admit that. But the likelihood is that the budget cap will fail too. Sure, there are such things as advanced accounting techniques these days but, if a team wants to cheat, it will find a way that evades the accountants. Manufacturers especially are adept at shifting money around to disguise where it came from and where it's going. Even so, I agree that it's preferable to the FIA employing spies to stand around and watch every team at work. Budget caps and restrictions on development tools both play into the hands of the big team more than the small ones - it's easier for the manufacturers to hide spending into other parts of their operations and they also have the strongest baseline from which to work from. Both rules give small teams much less chance to catch up for reasons that are frankly arbitrary. Both options are abysmal and will damage F1 as a sport. Since F1 has no justification for existence other than as a sport and never will be able to justify itself properly for greenness or road-relevance, Max should remove the double threat immediately.